It is hardly Spring in Houston, with our weekend weather close to 90 degrees. It feels much more like the middle of Summer. Friends and family in Michigan, Wisconsin, and Minnesota, however, all reported snow last week. SNOW!...While we're running around in shorts, tee-shirts and barefoot, planting our spring flowers. 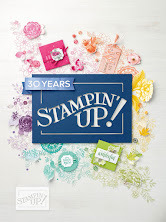 With just one more week remaining to purchase from the Occasions Mini Catalog from Stampin' Up! 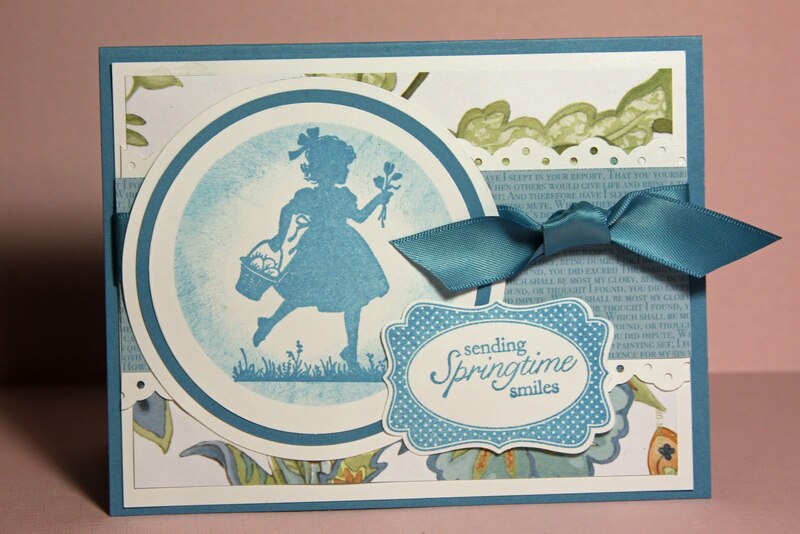 I'm showcasing the Easter Blossoms stamp set again. I've paired it with this month's Spring-is-Blossoming special. Here's the creations I came up with. As I often do, I like to make a couple versions of the cards I make to try different color combinations, background papers and sometimes different sentiments. 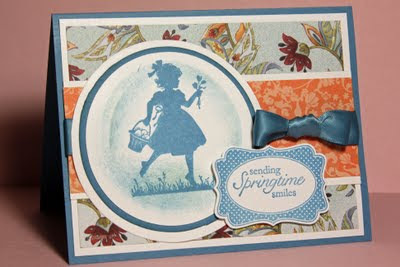 Both cards used background papers from Paisley Petals Designer Series Paper. 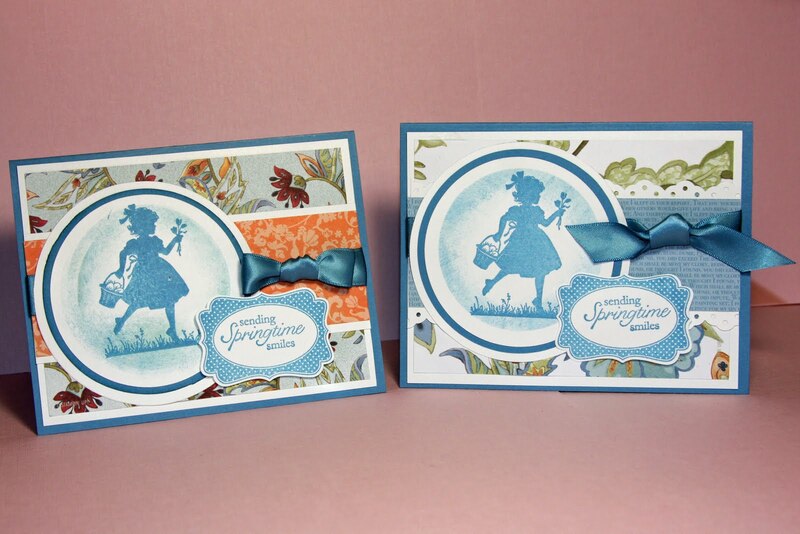 The card above uses two prints from Paisley Petals. For this kind of card, I think my favorite is the smaller patterns on the designer papers. I've always been partial to monochromatic cards, so the second version sent me looking for a patterned paper to match my Marina Mist card stock and image stamped in Marina Mist. The card below uses an additional paper from the Patterns Designers Series Paper Stack. I'm always surprised by how often when I can't find a coordinating paper among my Designer Papers, I reach for these wonderful Paper Stacks. Each stack has so much to choose from. Don't miss your favorites from the Occasions Mini catalog. While a few of the items may be picked up in the 2011-2012 Idea Book and Catalog, you will not be able to order them until July...or not at all. 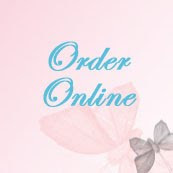 So look through your Occasions Mini Catalog and place your online catalog order today...this week... before April 30, 2011. Hurry, some items are already out of stock and no longer available to order, such as the Vinilla Rosettes. You can also take advantage of the April special. With a $20 minimum purchase, you qualify to order two brand new products from the upcoming 2011-2012 Idea Book a Catalog. 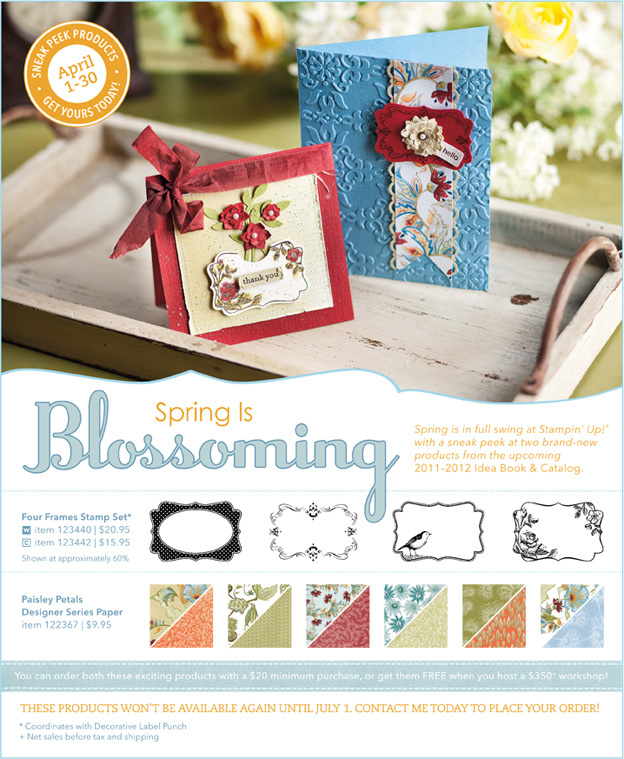 I've used both of these new products-- the Four Frames Stamp Set and the Paisley Petals Designer Series Paper --on the cards above. This special Spring-is-Blossoming offer is good this month (April 2011) only. After April 30, these two products won't be available again until July 1. 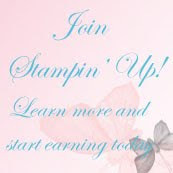 Read more about current Stampin' Up! specials, here.